A woman was startled early Sunday morning when an unknown man entered her bedroom, turned off the lights, and sat next to her. The woman quickly left the room and was unharmed. The suspect exited her apartment soon after. His motive, whereabouts, and identity are unknown. On Sunday, March 17, 2019 at about 3:45 a.m., our 24-hour dispatch center received a report of a suspicious circumstance in the 3900 block of El Camino Real. Police arrived at a residence and interviewed two women in their twenties about what had just occurred. The preliminary investigation reveals that about 30 minutes earlier, one of the women was studying in her bedroom when an unknown man wearing gloves and holding a flashlight entered the room. The suspect turned off the lights in the apartment and sat down next to her on the bed. He started talking to her. The victim left the bedroom and went to find her female roommate. The suspect then left the apartment. During the encounter, the suspect did not touch the victim, did not make any threats, and did not steal any items. At this point, the suspect’s motive is unknown. Detectives are actively investigating. It appears the suspect likely gained access to the apartment through an unlocked front door. 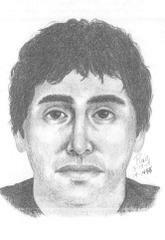 The victim met with a police sketch artist who produced a picture of the suspect. The sketch is attached to this news release. The victim described the suspect as a Hispanic male in his mid-thirties, 5’ 8 and weighing 180 pounds. He wore a dark hooded sweatshirt and black pants.